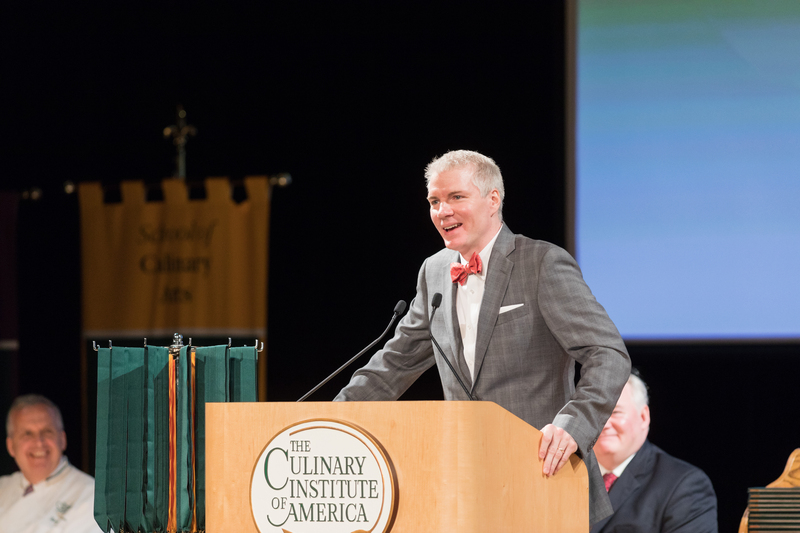 Hyde Park, NY – Brandon Chrostowski—a former candidate for mayor of Cleveland, OH and the founder, president, and CEO of EDWINS Leadership & Restaurant Institute—delivered the commencement address at the New York campus of The Culinary Institute of America on May 25. The film Knife Skills, a 2018 Academy Award nominee for Best Documentary Short Subject, is about Chef Chrostowski and EDWINS. Chrostowski has been recognized as a CNN Hero. He has also received an award for social entrepreneurship from the Manhattan Institute and been named to the Crain’s Cleveland Business “40 Under 40” list. In an effort to further serve his community, he ran for mayor of Cleveland as an independent in 2017 and finished fourth out of nine candidates. The day before the graduation ceremony, the CIA hosted a free screening of Knife Skills for students and the community, followed by a Q&A session with Chef Chrostowski. The entire CIA commencement ceremony, including Brandon Chrostowski’s address to recipients of associate degrees in baking & pastry arts and culinary arts, can be seen online.